They may not yet be household names, but these rising Evangelical figures should certainly be on your radar in the year to come. Travis Wussow was already on my radar. I wrote an article about him and the ERLC on October 14, 2016. Skeptic that I am, I can’t help wonder if the ERLC’s purpose of establishing an office in the Middle East is not at least partially related to the fact that it is a “strategic” move for fund-raising. I have noticed that the ERLC makes frequent comments about their Middle East location, and Travis Wussow does play the “danger card” in a podcast that I have partially reproduced below. Yet the exact location of the ERLC Middle East office remains a well-guarded secret. …I set about to discover where the ERLC Middle East office was located. All our research indicated Israel was the country the ERLC has chosen to set up their offices and where Travis Wussow lives. 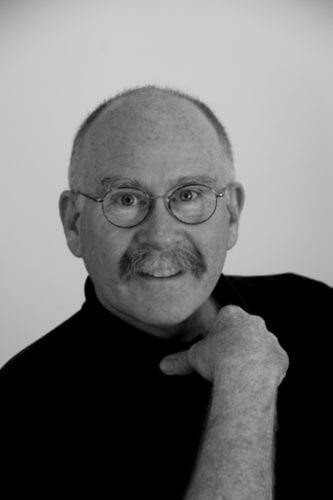 …When I began researching this article I emailed Wussow some questions. He was kind enough to respond and I must admit I was surprised that he answered me. …I actually found Wussow’s response rather silly. First of all, for a well-educated man who has traveled the world it is hard for me to believe that he considers Cyprus is part of the Middle East, or that he would think I wouldn’t call him on this. Let’s remember that every communication the ERLC has refers to establishing an office in the Middle East, not near the Middle East. I searched the internet and did not find a single list of Middle East countries that included Cyprus. You will notice in the screenshot below, taken from Chelsen Vicari’s article, the ERLC now admits their office is in Jerusalem! It would appear that Travis Wussow has lied to me. 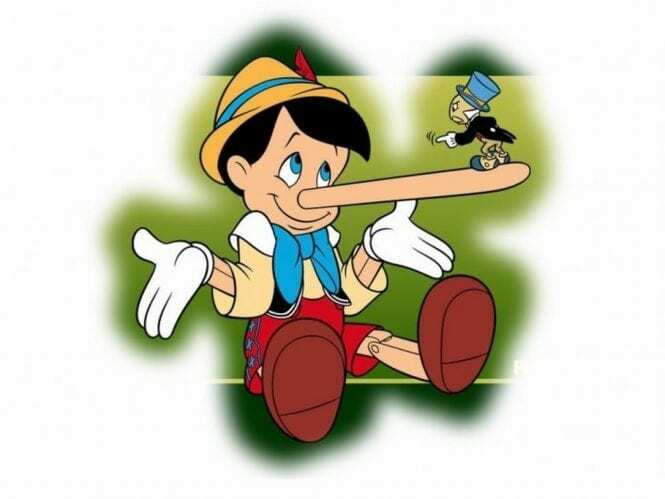 I sent him an email last week, asking him if he would care to explain his apparent discrepancy. To date, I have not received a reply. 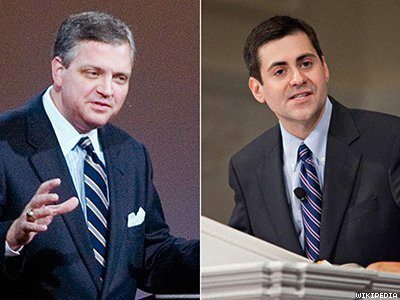 In my opinion, this is another example of what is wrong with Evangelicalism, and more specifically, the Southern Baptist Convention and the ERLC. When top Christian leaders cannot be trusted is it any wonder church members are leaving Evangelicalism in alarming numbers? I wrote a story in August 17, 2013 titled “Truth in Advertising.” In this story I revealed a hyped up scam David Platt and his publisher, Lifeway, perpetuated on the unsuspecting American christians. 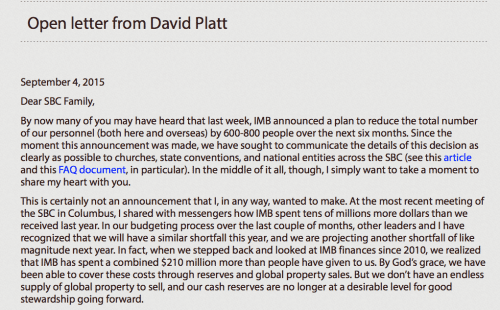 To my knowledge, not a single person in SBC leadership or Lifeway has acknowledged this dishonest sham. 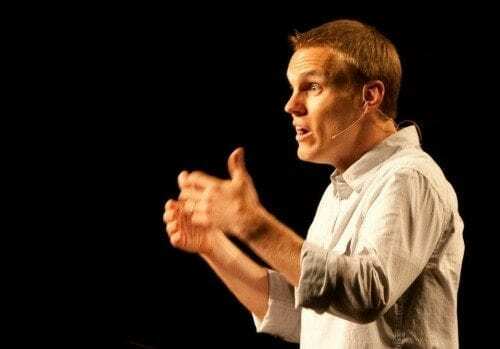 Platt has gone on to become a Christian celebrity speaker at numerous conferences and the head of the SBC’s International Mission Board. Aren’t Christian pastors, and elders to be above reproach? Wouldn’t it be reasonable to also expect one of the top men in the Ethics and Religious Liberty Commission to be above reproach? The view from my seat among the “rock-throwing peasants” is that while Mark Dever’s 9Marx organization is a huge proponent of discipline for the “little people,” the celebrity leadership remains totally unaccountable. Until such time as blatant hypocrisy stops, expect further erosion of the evangelical movement. Perhaps the ERLC put an office in Israel so that they would have an excuse to take trips there and visit all of the religious sites? I would guess the trip pays dividends by garnering financial support for the ERLC from the tourists. In light of the Baptist News article I am even more mystified as to why Travis Wussow would lie to me about the location of the ERLC office! “Rock throwing peasants!”I have been laughing for the past 30 minutes. Why do you expect honesty from these guys? They are told what to say and how to say it. None of them would take a job that would put them in danger. They are too important. I don’t know, maybe I am an optimist? Some day evangelical leaders will be honest, and the Minnesota Vikings will win the Superbowl. It just won’t be this year. 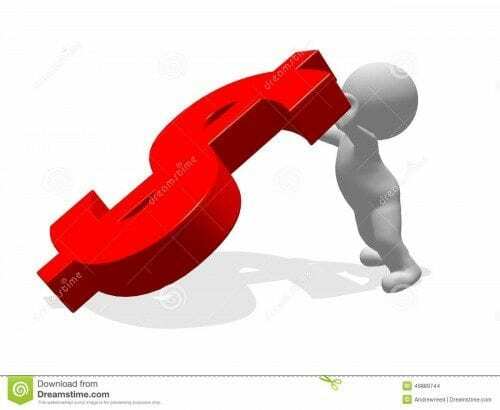 yearly with a church leader for follow-up, encouragement, and help in these pursuits. *sigh* As a grad of UT Austin (class of 1984) and former resident of Austin (keep Austin weird), I feel sorry for the students and locals sucked into this outfit. 🙁 *The* Austin Stone Community Church? How pretentious. I also feel sorry for them. yearly with a church leader for follow-up, encouragement, and help in these pursuits.” – It may be time for Wussow to have his yearly follow-up! As if you can’t commit to following up with a church leader, once a year, without signing a written contract, designed to be legally-binding in the secular world, to that effect? The motive of these commitments is to shape and encourage Godly character in our people. 1) That’s interesting because many Pastors of authoritarian Churches say that it’s a sin to judge or even “speculate” about anyone’s motives. I guess that Church leaders are exempt from following the rules they create. 2) That’s interesting because it communicates the following. If you don’t agree to sign on to these so-called Church contract commitments, we may grudgingly say that you’re probably still a Christian. However, we will definitely treat you like a piece of crud who does not want to encourage Godly character by signing a simple little Church contract that we asked our lawyers to review, at length, because we want to wave it in your face when you try to involve the civil or criminal legal systems in whatever awful things our Pastors are doing. Yes, I am being cynical. However, it is unfortunately a cynicism I’ve developed having seen how “church contracts” are used to intimidate, not support or protect, ordinary people. It’s nuts. Watermark Community Church in Dallas is an innovator of church discipline, and they’ve been doing a professional-style performance review for years. I would imagine the idea comes from them. Remember, you’re dealing with a lot of young adults including singles who really want to meet Christian friends. I imagine it’s difficult to connect socially without becoming a “partner”. And you’d better believe the mandatory tithing commitment applies to undergraduates working part time. Yep, you nailed it. The rules are only for the giving units in seats. Perhaps I missed it in one of your earlier posts, or on the ERLC website, but what is the purpose of the International Justice & Religious Liberty office and why is it in Jerusalem? I would think that the nature and location of the office would make it a denominational copy of the ACLJ…but, come to think of it, the SBC is very good for seeing something someone else is doing and then ‘baptizing’ it by recreating it within the SBC ranks. Some friends of mine and I have had many laughs over the years about this. Back in the early 90’s, Mohler was named as an rising star up and coming evangelical. It wasn’t good for him, either. Good find, though, on the Jerusalem office. No, he was not forthcoming. And since the he ERLC is so into power politics now and seeking to denounce those who don’t think like them but pay their high salaries, , they are strangely silent on the recent UN vote. Maybe I missed their commentary. Oops. This was in Time magazine. 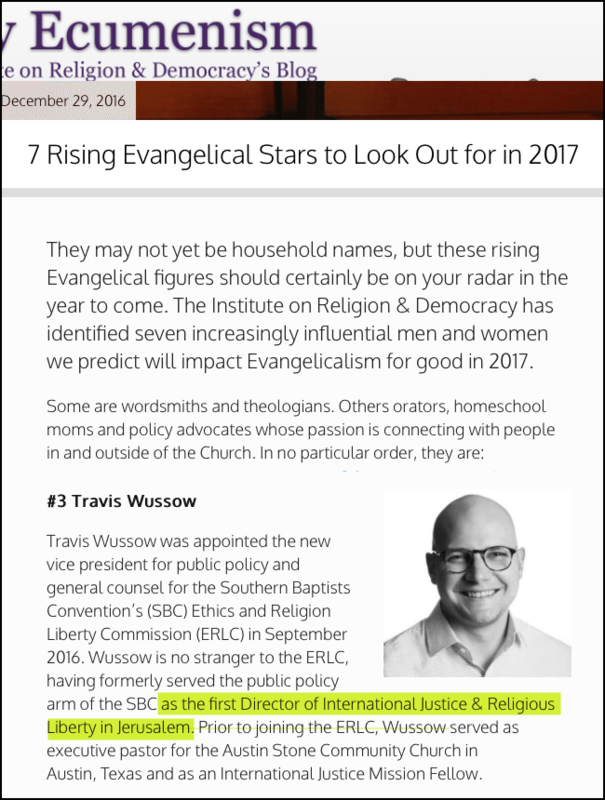 Hey Buddy!, I found this information for you: "“Rising Evangelical Star” Wussow is Truth-Challenged". Here is the website link: https://thouarttheman.org/2017/01/10/rising-evangelical-star-wussow-truth-challenged/. Thank you.